CLICK HERE to request a FREE Emergency Pet Rescue Decals and Magnet. In the event of an emergency, pet rescue window decal alerts rescue personnel that pets are inside your home. 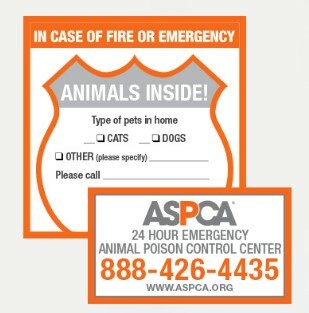 The safety pack also includes an ASPCA Animal Poison Control Center magnet—a great way to keep the ASPCA's toll-free emergency number and website address handy in case your pets get into something they shouldn’t!